We Are Here is a new magazine created and edited by Conor Purcell, (who is also the man behind the book The Dubai 50 which I wrote about last year). 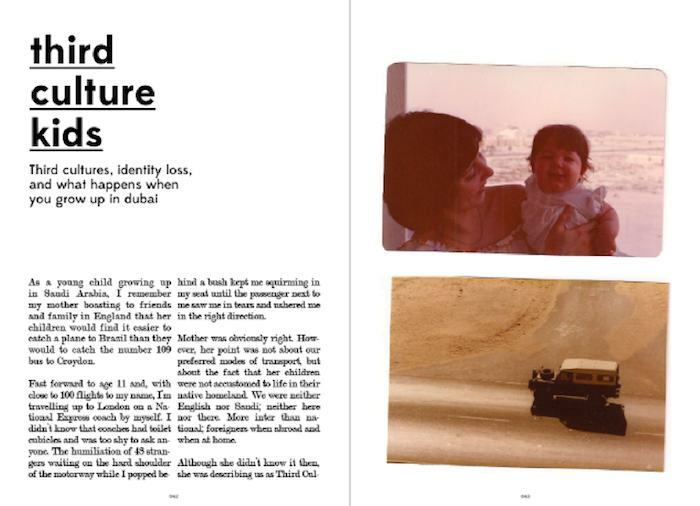 "We created this magazine so we could write about Dubai in a new way; so we could cover the city without resorting to hyperbole or cliché; the two default settings of writers both from Dubai and from abroad. The other thing we felt was missing from coverage of this city was humour. 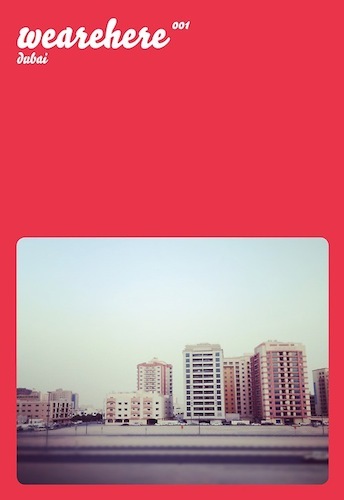 Dubai is - or should be - fun." "The intent is to produce a long-form postcard from each city we cover; to showcase a tiny fraction of the stories, people and places that make a city unique." 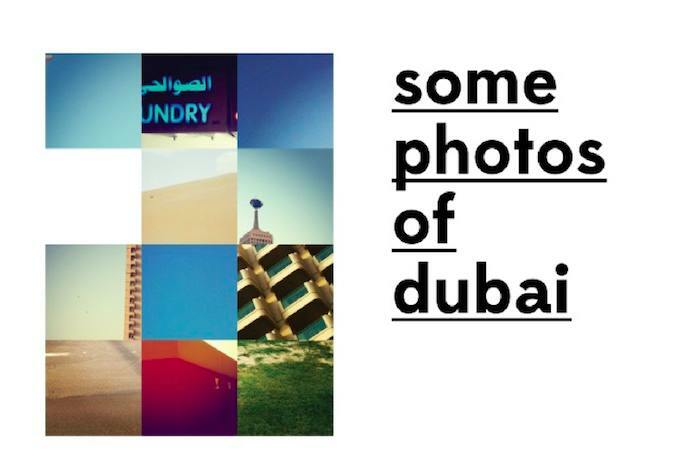 I love this idea of a "long-form postcard" dedicated to a city, and I also love it when you get to see and read about the human side of Dubai. When I talked to Conor about the magazine, the one comment he made about it that stayed with me is that "there's no call to action". The magazine isn't trying to promote or sell anything and that is very, very refreshing to hear in this town. The size of We Are Here is smaller than your average magazine, and I quite like the design and layout. All the photos were taken with an iPhone using Instagram, so visually, it stands out compared to lots of magazines, but I do wonder over time if this look will wear out. 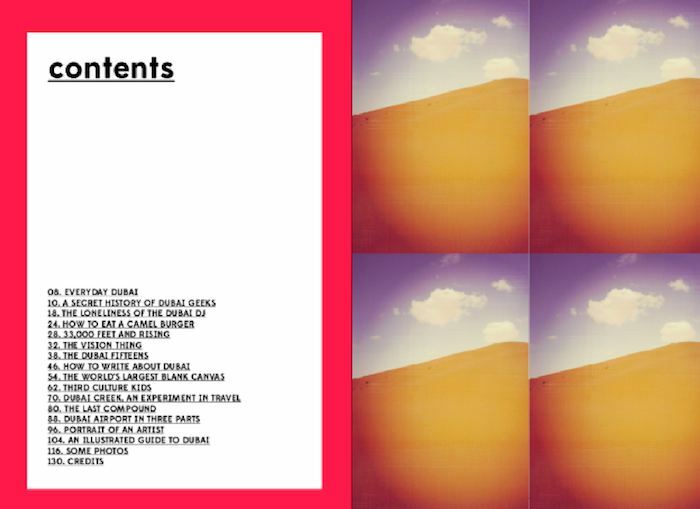 There are some funny and personal articles in it, my favourites include 'Third Culture Kids', 'Dubai Creek, An Experiement in Travel', 'The Last Compound', 'Dubai Airport in Three Parts' and 'Portrait of an Artist'. But the magazine also made me feel it didn't have enough voices of people that were born and bred here. It had a bit of an "expaty" feel to it. 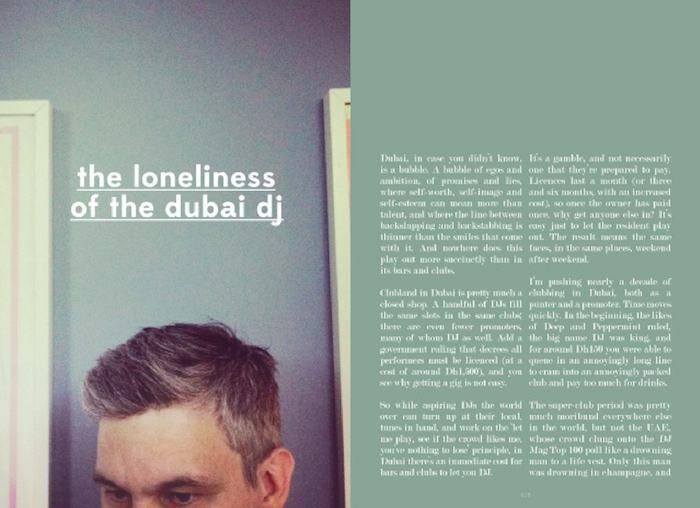 Perhaps I'm more sensitive than most when it comes to reading about the human side of Dubai. People come and go so fast in this town, and the voices of the ones that have always been here do not get to be heard that often. The city is so used to promoting the new and always looking to the future, the voices of the old timers and the ones that remember do get lost in all the noise and the brouhaha. I decided to discuss this with Conor and find out more about We Are Here. The Culturist: I remember you telling me when we last met the magazine doesn't have a call to action, it isn't about telling the reader to go somewhere. Can you elaborate a bit more on why you came up with this magazine and will future issues contain the same spirit? Conor Purcell: Yes, I think good travel writing does not promote a destination, it just gives the writers’ viewpoint – the best travel writing from Mark Twain to Paul Theroux follows this pattern – of course modern travel magazines ‘sell’ destinations, which takes away from their integrity. I want the future magazines to be a snapshot of a place in time – that’s all I can hope for. TC: How did you decide on the list of contributors for the first issue? Did you struggle to get people to contribute? Conor Purcell: I got a local writer’s group to ask for submissions and I got more than 30 pitches. I also came up with some ideas and asked writer friends to contribute. It was easy to get contributors and ideas, less easy to get good ideas and good pitches. I did try to get Emirati writers involved but no one responded. TC: Who is your target audience? Conor Purcell:I don’t really have one – I don’t think in those terms – the magazine is something I think is needed and so I produced it because its fun and I can see it getting better each issue. Of course, I hope people like it, but as to the demographic of the reader, it’s not really important editorially at least. TC: Did you take all the photos in the magazine? I recall you saying you used Instagram because you like the aesthetic and ease of use, but do you worry the images over time will look gimmicky? My issue with Instagram these days is that the images no longer stand out, they all look the same. The photographer's eye and personal touch doesn't stand out, anyone could've taken any of the photos shown in the magazine. Do you agree/disagree and what are your thoughts on this? Conor Purcell: I took most of the photos. I think Instagram levels the playing field and it’s less about the quality of the camera and more about the composition. I wanted a coherency throughout the magazine in terms of the design, and the photography is a big part of that. I think if a lot of different people had taken photographs it would have led to a problem with consistency. I also wanted to create a more granular effect – less aerial shots of the Creek and more ground-up photography. TC: Overall, the magazine feels more like it's written from a perspective of an expat, an expat that has lived here for a few years and knows the city. I found some articles a bit clichéd like 'How to Eat a Camel Burger', '33,000 Feet and Rising - A Cabin Crew Life' and 'How to Write About Dubai'. Apart from a couple of articles like 'Third Culture Kids' and 'Portrait of an Artist', the magazine lacks an authentic voice and point of view from someone that has lived here for decades/grew up with the city. What are your thoughts on this? Conor Purcell: I disagree that the articles are clichéd – the cabin crew was honest – and the How to Write About Dubai was a satire on foreign news articles – a clichéd article would have written about the great strides the city had made or something along those lines. Of course, the magazine is in my voice, and I am an expat who has lived here a number of years, so it makes absolute sense that is how you perceived it. Most of the city’s population has not grown up here – so in many ways, the magazine is an accurate reflection of the city. It is a transient place for most of the population. In most cities, the natives are in the majority, and so future city issues will reflect that. It did surprise me that no one who has grown up here has started a magazine to put their view point across – but maybe there is something in the Arabic media I am unaware of. I did try to get Emirati voices in the magazine, but was unable to. But, for me, nationality is less important than having something to say. TC: The magazine has received some very good publicity. Which review or coverage made you feel proud/happy with the feedback? Conor Purcell: I was surprised by the feedback as its very much a work in progress. I was happy to get nice comments from the likes of Monocle, Jeremy at Magculture and Matt Wiley. I am about 50% of where I want to be in terms of quality, so looking forward to keep improving. Here's a list of stockists where you can find We Are Here. The second issue will be out in March, it will also be about Dubai, so I'm curious to see what new angle on Dubai will we see in the upcoming issue. Conor said the third issue will be about Kathmandu which will be out in June. It's a city he's visited before and intends to go back to spend more time there and work with local writers and photographers. Here's to independent publishing and hope to see more of this in Dubai.